A design can be drawn up for your steel building remotely. The prefabrication happens off-site, but what about when the metal hits the turf? Site preparation is an aspect of metal building construction that dictates how smoothly your project goes. It even dictates how long your structure will last. Surveys and permits are only the start. There are things you can do yourself as the property owner to prepare a site. However, there are steps you will probably want to leave to the professionals. If there is an existing structure on site or if the land needs clearing of vegetation, this can be hard and dangerous work. Demolition crews use a lot of heavy equipment. After the tear down stage, you’ll also need to haul away and dispose of the demolished materials and brush. You may need to coordinate with the city to haul off materials, or rent containers and pay for several trips to the landfill to transport the debris yourself. Removing any trees (and digging out the stumps) is another task that most people need help to accomplish safely. Your local municipality can have someone to come out and mark where utilities currently run through your property. But, they will not dig up or reroute anything to make your site ready for the installation of a new building. It’s not something you can try yourself either. You need a professional team to relocate utilities and to connect utilities to your new building. There are strict state and local regulations for working with utilities. So, any contractor you hire must be familiar with these rules. Undeveloped land is often irregular. Building on a steep slope or on an uneven surface can create serious problems for the stability of your structure. 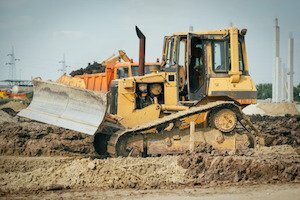 Land grading involves heavy equipment and a precise understanding of how to engineer a site to prevent erosion and runoff that could threaten your new installation—or surrounding buildings and landscape features. A well-prepared site with proper drainage and a level space for construction sets up your installation to progress smoothly. Whether you need foot access to an outbuilding, a driveway for a couple of vehicles, or a full parking lot and sidewalk to meet customer and employee needs, using the right materials and installation method makes a big difference in the functionality of the completed building. The paving choice should factor in things like drainage, soil stability, durability, maintenance, type and volume of expected traffic, and aesthetics. In some cases, doing this stage first may be essential to ensure access for the work crews who need to get to the installation location. Can You DIY, or Should You Get Help? There are pros and cons. If there’s not much work to be done in preparing the site and if you have the time, tools, and skill set to get the job done, it may be fine to take care of this yourself. A small project like a car port or a storage shed might be well-suited to this approach. Especially if you have some friends who are willing to help out. Just bear in mind that if there are any injuries there may be a claim against your property insurance. If it’s too big a job to take on yourself, you can always choose to hire local contractors to handle the various aspects of site preparation for your metal building. In that case, prepare to spend time vetting these contractors and staying on top of the project for a timely completion date. Otherwise, there will be a delay with installation. The third option is to take a “one-stop-shop” approach. Our customers often come to us because they want the ease and simplicity of a steel building project. And they don’t want the expense, risks, and hassle that come with managing all the site prep. We’re always happy to get involved with a project from the start and save our clients the headache and frustration of trying to get their property ready for our prefab metal building kits. To explore our steel building construction services, start here. Here is a progress note. We are 99% finished. Ross has repeatedly pointed out the improvements of this building over previous buildings he has worked on. It is looking good. Electricity is going in today. Thank you for a high quality product. Read more . . .
My experience with Peak Steel Buildings has been nothing but positive. Will has always been very knowledgeable and available at all times to answer questions – even after business hours. Thank you for your personal service to make sure my project was on time and on budget. Read more . . .
We’ve known Will George with Peak Steel for quite some time now and he has never disappointed. He always responds to emails and phone calls quickly and gets our quotes to us in a timely manner. Will not only gives us reliable service but competitive prices. If you are looking for someone to handle your metal building needs our suggestion is Peak Steel. Read more . . .
We have dealt with other companies in the past, but none have matched the service we receive from Peak Steel Buildings. I have had competitive quotes on a variety of projects both simple and complex, and have had excellent service both before and after the sale. They will be our supplier of metal buildings and components in the future. Read more . . .
Oh my goodness it’s awesome. As a contractor/customer with Peak Steel Buildings it has been a pleasure. Wonderful crew and wonderful product always just like it should be. Read more . . .